What could be a better way of seeing Langkawi the way the birds do? 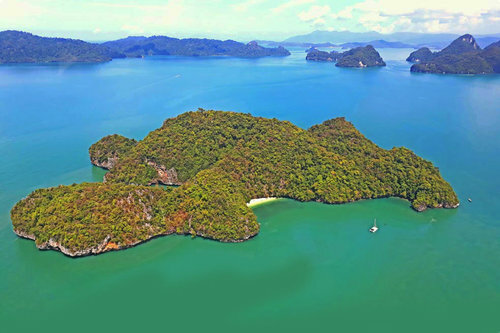 Unless you take a helicopter ride and see with your own eyes the panoramic views of the island, its mountains and the emerald green water of the Andaman see, many tiny islands, the lakes & lagoons and the sailing yachts for yourself as you hover around the sky, it is difficult to believe what such an experience can be. While we almost always make it a point to take a helicopter ride when we are in Langkawi, all those that we have met who too took such rides, had only one thing to say ... It's awesome!! While some rides can be expensive, you can even take a 5 minute ride over the Pantai Cenang beach and the sea area to get a feel of what such views can be. But to have a good feel, you should take at least a 30-minute ride. There are several sightseeing helicopter rides offered in Langkawi by licensed operators. while rides are not too cheap, there are sharing rides with per person rates which turn out to be quite affordable, and there are chartered flights which are more expensive and suitable for small private groups. The helicopters used are of different makes and can accommodate 3 to 4 passengers depending on its make, plus a pilot. But all helicopters used have wide glasses on all sides so that you get a wide range view and are able to take great photographs. Some rides start and end at the Pantai Tengah area (heli base) near the Frangipani Resort, while the others take place from the Langkawi Airport. While the flights operate all days, they are subject to weather conditions. Although this is a short ride, it is one of the most popular ones because of the areas it covers. You will get great views of the Tengah beach area and then fly towards the southern islands, hover over the stunning Lake of the Pregnant Woman in Dayang Bunting Island. Just from 500 feet above the lake, you will get marvelous views of the water area, the sea and the mountains surrounding the lake and see below people paddle boating in the lake. The flight also covers the Kuah area in the east. This helicopter ride will take you over the Kilim river and give you a birds eye view of the famous and spectacular Kilim Geopark located at the north eastern side of the island. You will get breathtaking views of the mangroves, the limestone cliffs rising from the shore, the river and the water areas, many islands and more. Additionally you will fly over the highest mountain peak of Langkawi - Gunung Raya, and over several popular white sandy beaches including Tanjung Rhu, Pantai Cenang and Pantai Tengah. This ride explores the beautiful mountains, beaches and harbors of Langkawi from the sky. You will fly over the famous beaches Pantai Cenang and Pantai Tengah, and see many beachside watersport activities like jet skiing, para sailing, banana boating etc as well as the blue water with waves pounding at the shore and the nearby islands from the sky. The helicopter will then move towards north along the western coast line and hover around the picturesque Telaga Harbor with its beautiful marina having backdrop of the mountains. You will see sail boats in the harbor and many yachts moored in the marina. After flying over the Koh Beach, the helicopter flies over Mount Matcincang, the second highest mountain in Langkawi and you will see the famous Cable Cars with breathtaking views of the mountain range all around and the tiny islands below at the sea. The helicopter then moves towards the north western end to show you the stunning views of the Datai Bay area and couple of exclusive beachside resorts here. During the day time you will see many foreigners lounging at the private beach. You will then move towards the central part of the island and fly over the highest mountain - Gunung Raya and see from the sky its lush rainforest before returning to the base. This one hour heli ride would cover most of the sightseeing mentioned above and can also be customized if you are in a private group. Here are the most popular operators offering helicopter rides in Langkawi along with their offerings, indicative rates and contact information for booking & inquiry. Note that while children of all ages can board the helicopter, they need to be accompanied by an adult and there is usually no discounted rates offered for children as seats are limited. They operate from the Pantai Tengah heli base near the Frangipani Hotel. Monday through Sunday from 10am to 7pm. Their helicopter is a Robinson R44 which has an enclosed cabin with wide glass. It can accommodate 3 passengers (one next to the pilot and two in the second row). The helicopter has a length of 9-meters and cruises at an average speed of 200 kms/hr. Rates: They offer rides on a sharing basis with per person rates. Most of the rides that I described above are offered by them. 15 minute tour: RM425 per person; 30 minutes tour: RM 875 person; 45 minutes tour: RM1300 per Person; One hour tour: RM1750 per person. Note that if you book for a group of 3 persons, then the rate for the 3rd person is considerably lower. If you just like to take a short 6-minute ride, it may cost RM450 for two persons. You will need to book and pay all tours in advance. Helistar Resources Sdn Bhd was established in 2009 by a group of experienced aviation professionals. Their helicopters operate from Langkawi International Airport at Padang Matsirat. Their rides are most suitable for private charters for a small group of up to 4. They use EC120B helicopter with large windows which has a passenger capacity of 4 plus a pilot. It is Eurocopter make, has a single engine and cruising speed of 203 kms/hr. Rates: The rates offered are for the full helicopter for small private groups of up to 4 persons. 15 Minutes: RM1240; 30 Minutes: RM2475; 1 Hour: RM4950. While there are set tours similar to the ones described above, you can also customize your trips and the company will offer quotation. Apart from the above sightseeing tours, they also offer trips for aerial photography & filming, and also recreation, golf, fishing trips to remote areas etc. I checked Langkawi Outpost's website yesterday and they quoted the same prices you mention here. So I decided I would love the 1hour tour, along with my partner, so we asked our hotel to phone today to make the booking. BUT Outpost said it would cost us RM5,600! There was no reason for the huge increase in price, so I can only assume they just want to rip off tourists! So I did not make the booking, and they lost RM3,500 by being greedy.